Springfield Business Journal and United Community Bank are pleased to sponsor this year’s “Best Places to Work,” recognizing outstanding businesses in central Illinois. Perhaps not surprisingly, two of them are family-owned businesses and the other followed in his father’s footsteps in the same industry. All three company owners grew up in their respective industries and all say their employees are part of the family. The other common theme is that each gives back to the community in many different ways. The program is open to any business in Sangamon or Morgan county with 35 or more employees. Many of the nominations were submitted by the employees themselves, in other cases someone who had worked closely with the company made the nomination. A reception and awards ceremony will be held in January at United Community Bank’s Montvale branch and Mayor J. Michael Houston will present awards to the three selectees. We appreciate United Community Bank’s ongoing support that allows us to honor these worthwhile businesses. 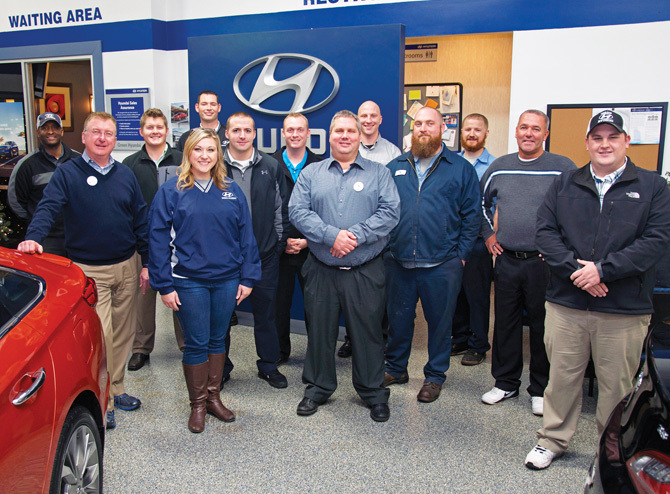 Todd Green believes in giving back to his community, to his customers and to his employees. In particular, he truly cares about the people who work for him. If you make an investment in your employees, it pays off. “I’m pretty fortunate,” said Green. “I have really great people working for me. “My staff is very loyal,” he continued. Earl Lyons, parts manager, has been with Green Family Stores since 1983. Green empowers his employees to make decisions. It’s working. “I wouldn’t be sitting here if I wasn’t doing something right,” he said. 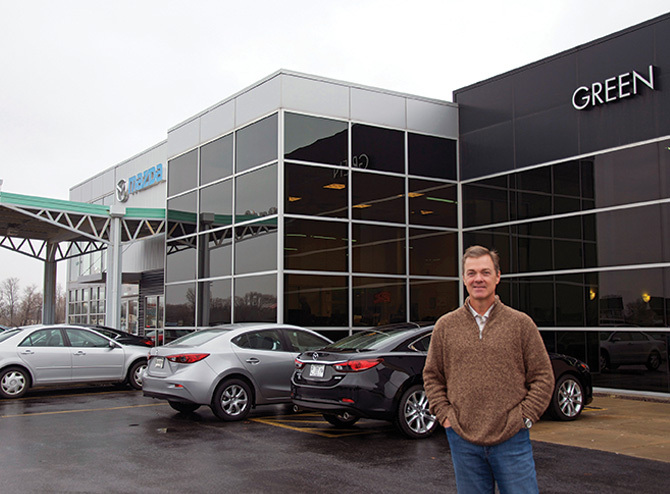 Green Family Stores owns or has part ownership in 11 dealerships, including dealerships in Davenport, Iowa; Jacksonville; Moline; Peoria and five in the Springfield area. The company employs about 590 employees; about 310 work in the Springfield stores. Green was born into the car business. He was born in 1959 on the day the first Chevy Corvair was released. His dad owned a Chevy dealership in Monmouth. His philosophy was: It’s not about the cars, it’s about the people. That philosophy has stayed with Todd. In 1983, he purchased his first Toyota store in Springfield. “That’s where it started,” said Green. Up until 2005, the Green family focused on dealerships. The company started Green Family Insurance in 2013 and purchased The Gold Center, Illinois Certified Testing and The Club at the Strand in Naples, Florida in 2014. Future plans include acquiring more stores and building new ones. He also plans on purchasing several more golf course communities. Green said people often ask him if he wants to own every store in town. “If you do a great job with your customers, why wouldn’t you?” said Green. Green started the Green Family Charitable Foundation and every month writes checks to local not-for-profit organizations. He writes an average of five checks a month, depending on the needs of the community. Among the organizations he supports are: The Matthew Project, Catholic Charities, Salvation Army, Sparc, Boys and Girls Club, St. John’s Hospital and youth football. “It gives me a lot of pleasure,” said Green. During the course of preparing this story, Todd Green casually asked our reporter to name their favorite charity. The reporter’s choice was the Animal Protective League. At the end of the interview, Green handed our writer a sizeable check made out to the APL. Rachael Buraski, director of marketing, said Green also calls the schools every year to see how many kids need coats. “He doesn’t want any kid to be cold,” she said. “If he sees a cold kid, he takes care of them.” This year he purchased almost 800 coats. Buraski said the company’s number one priority is to take great care of the customer before and after the sale. To do this, you need happy employees who genuinely love what they do. Twenty-six-year-old service advisor Colin Liss has been with the Green Family Stores for six years. He came in one day with his mom, Susan, who wanted to buy a car. One of the sales people asked him if he would like to work there. “It seemed like a good fit,” said Liss, who loves the work environment. “Everyone is treated really well. “The guy in that office is extremely generous,” he continued. The other day Liss was doing an oil change for a regular customer and asked how she was doing. She said not very good. She was filling out a stack of cards. It turned out she had lost someone in a car accident. Liss gave her a $50 gift card to Bella Milano and took $50 off her bill. “I would never be able to do that if I did not have people above me empowering me,” said Liss. “It’s truly about the employees,” said Green. From going to Cardinals games to taking the technicians out to dinner, he wants his employees to feel as if they are part of something great. Every year the company hosts an employee holiday party with food, drinks and prizes. Employees have the chance to win prizes or cash ranging from $25 to $500. “In 2013, we gave away more than $250,000 in cash and prizes,” said Buraski. Among other programs offered to employees are the chance to buy a computer at a discount and a quit smoking program that pays them $1,000 if, at the end of one year, they have quit smoking. There is also an onsite workout facility. Green said his favorite day of the week is Monday because he can’t wait to get back to work. Building relationships within the community and interacting with customers and his employees are his golf game. “We are central Illinois,” said Green. The key to Niemann Foods’ success is its associate owners. Everyone is family, and this tone is set by Rich Niemann, Sr., company chairman. Niemann Foods, parent company to County Market, is a third-generation, independently operated, family-owned business. “We would not be able to do what we do without our dedicated associate owners,” said Rich Niemann, Jr., president and CEO. “That’s what sets us apart,” he said. While the company has been sharing profits with its associates for 60 years, it formally became an ESOP company 17 or 18 years ago. ESOP stands for employee stock ownership plan. “This is the best thing we ever did,” said Niemann. Springfield is central to the company’s business. It opened its first County Market store here in 1986 on Veterans Parkway. Its newest store at Second and Carpenter is typical of the stores the company is building today. Niemann Foods owns 105 retail stores. County Market stores are only one part of the company’s business empire. It also owns Save-A-Lot grocery stores, Harvest Market convenience stores, Pet Supplies Place stores and Ace Hardware stores. It is planning to open new locations in Decatur and Champaign next year. The company employs slightly more than 5,000 associates; about 950 work in the Springfield area. It operates 11 stores in Springfield and the surrounding area that includes Auburn, Chatham, Girard, Petersburg and Sherman. There are four County Market stores and a Save-A-Lot store in Springfield. “Retail is very detail-oriented,” said Niemann. “It gives younger people the chance to get their legs under them.” Associates have the opportunity to stay and advance within the company as long as they are willing to take on responsibility. “It’s our responsibility to provide jobs for entry-level persons,” he said. The grocery business is always in a state of evolution. “It’s not the same as it was 30 years ago,” said Niemann. “We have to be on top of that.” The associates know what the customers’ needs are and they tell the company how to meet those needs. “We want to make people happy,” he said. “We appreciate our Springfield customers,” continued Niemann. “This is a great area to do business.” The company has a lot invested here. Niemann Foods believes in giving back to the community and established the Niemann Foods Foundation. This year the Springfield stores filled over 4,000 bags with groceries during the Fall Harvest promotion to donate to the Salvation Army. “It’s important to be involved in the community you do business in,” said Niemann. Niemann and Kettler acknowledge that this award reflects largely on the associates. “It’s all about them,” said Niemann. “We’re only as good as the last customer at the check stand.” It is the associates who have constant interaction with the customers; everything revolves around customer service. Amy Johnson works at the Chatham County Market. 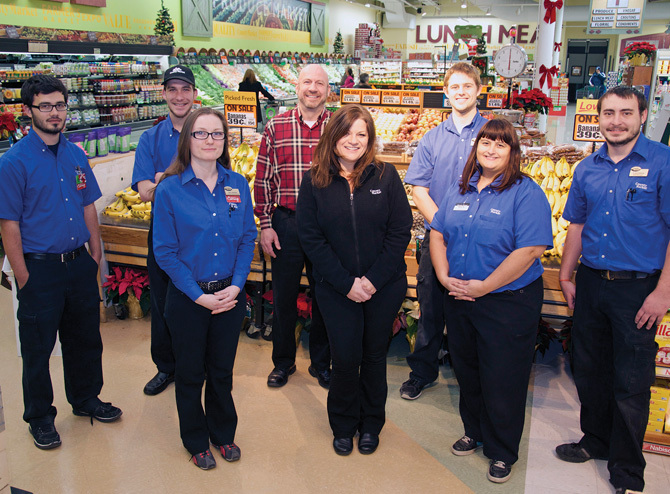 As she wrote on her nomination form, she loves that Niemann Foods still dedicates itself to providing the “family-owned grocery store” feel, not only to customers, but to associates as well. As she wrote, associates are welcomed into a fair and friendly atmosphere which promotes the opportunity for personal growth. One great opportunity offered to associates is the chance to be an owner. Profit-sharing gives the associates a say in the company. The associates are a family – a team – who work together to provide excellent service to each other, the company and customers. The stores send out a weekly email that recognizes special contributions by associates. “It’s a great spot to be recognized,” said Niemann. “If we take care of our associates, they take care of our customers,” he added. John Faloon, president of Springfield Pepsi-Cola Bottling Company, understands hard work. He started out driving a beer truck when he was 18 years old. He comes in at 4 a.m. when the route drivers start their day. “It’s important to create a work environment where the route drivers see management is here to support them,” he said. Route supervisor Larry Patterson has been with the company for 29 years. He ran a route for 15 years. The company has taken good care of him. “They’re pretty good people to work for,” he said. A fourth-generation, family-owned business, the company has been in the Vecchie family since 1941 and currently employs 75 people. Faloon started working here as a bulk manager and took over the reins about 12 years ago. “We’re nothing more than stewards of something created before us,” said Faloon. “It’s our job to get the next generation ready.” His son is a route driver. The company outgrew its Cook Street facility and moved into a brand new one on Singer Avenue two years ago. “It was important for us and the community to stay on the east side,” said Faloon. Everybody is proud of the new facility. When people walk through it, they comment that it’s the cleanest place they’ve ever seen. If someone sees a piece of paper lying on the floor, they pick it up. He acknowledges that it’s not the building; it’s the people. He strives to create a friendly atmosphere for his employees. The staff is very close-knit. “Everyone treats each other with respect,” said Faloon. The employees are proud to be associated with Pepsi. The company fosters an open-door policy from the corner office to the warehouse receiving office. Everyone is more than just an employee; they are treated as part of what makes this company successful. Office associate Kimberly Dowllar has been with the company two years. Coming from a big corporation, it was a change to come work where everyone was warm and welcoming and you know who you work for. “I hit the jackpot,” she said. Three employees have been with the company for 38 years: Alan Bernahl, route supervisor; Ivan Fink, service technician; and Kevin Geist, warehouseman. Together the management team has more than 100 years of experience. “It’s unheard of to have people with that tenure,” said Faloon. The company promotes employee health and wellness. There is a workout room that is open to employees and their spouses. “It gets used a lot,” said Faloon, who admits he was initially nervous about making that kind of investment. The company also offers free flu shots and health screenings. His wife, Shawn, puts together baby baskets for new moms. Each basket contains children’s books, baby bibs and overalls embroidered with the Pepsi logo. Faloon believes in giving back to the community. “We’ve been here for four generations,” he said. “We’re not going to pack up and move.” Each week he receives a folder filled with donation requests. While he can’t help everyone, he tries to help as many as he can. His favorite program is Sangamon CEO, a business training program for high school seniors. “I love it,” said Faloon. “It is the greatest program.” He sees it as a great thing for the community. One day he hopes to see a graduate of the program establish a business in Springfield and have it be named Best Place to Work. 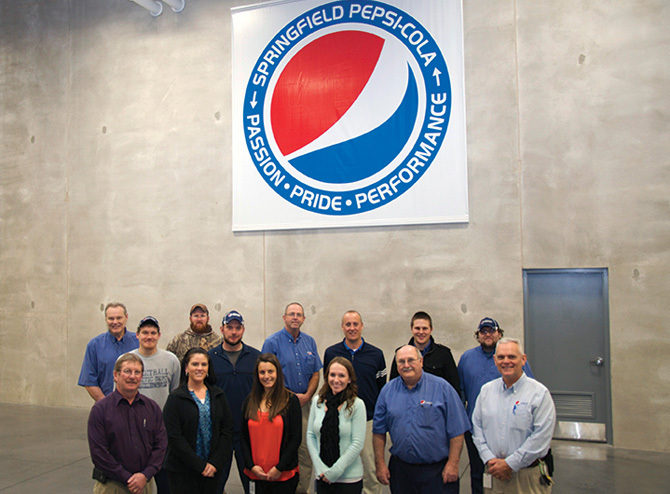 Pride, passion and performance are the qualities that set the Springfield Pepsi-Cola Bottling Company apart.